2018 Challenge No. 1 - COMPLETE! I suspect that nobody is more surprised than me, but I have indeed managed to start 2018 off with a straight month of doing some form of exercise every day. when I first committed to this I knew it was going to be a tall order for me - I knew there would be bad weather, at least a couple of days when I might feel a touch hungover, and above all that the level of impact on my joints might cause a problem. Well all of the above proved to be the case but I've dealt with them, and that's it - Exercise Every Day in January is complete. I dealt with the "stuff" that I knew might get in the way by factoring in some lower impact stuff - and stuff that could simply be done indoors too. At the point where my joints really needed something different I reduced the running, threw in a swim, and cut the impact right down for a few days. I've been lucky with the weather - there's not been any significant ice and no snow at all, and the wet run I had a couple of weeks back just goes to prove quite how much I hate running in the rain. One VERY hungover morning last weekend rather than doing my planned HIIT Hotel room session in the morning I switched it to the evening instead, and brisk 2 mile plus walks have filled in some days when for whatever reason I wasn't going to be getting anything else done. I've averaged nearly 16,000 steps per day and covered nearly 220 miles during the month walking and running. So the learning curve then - That I'm capable of more than I give myself credit for is one thing. And that actually I can be quite determined when I have a challenge to get stuck in to. That doing anything high impact for multiple days on the trot is NOT an option for me as it does give my knees and hip problems, but so long as I intersperse high and low impact exercises I'm fine. That ALL the good stuff they say about swimming is spot on. That the "runners high" is a real thing and is why a really good run in the evening is sometimes not a good thing for me (stops me sleeping!). I've really discovered how much I enjoy feeling fitter - and to an extent I've kicked myself for not remembering it sooner. 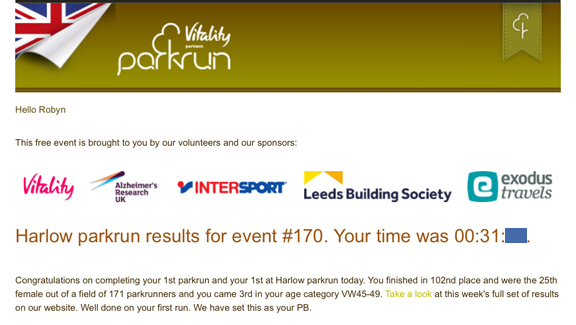 Other stuff too - to watch my pace at the start of a run or the second half gets REALLY tough. That running up hills (or in the rain) isn't my thing. That I will never have the determination or the attention span & patience to even think about running a marathon. And that running can be really handy when it means I can drop the car off at the garage and run home FAR quicker than I would if I walked! It's a great feeling that I can now run further than MrEH - he plays rugby weekly and trains at least twice a week in addition and is a lot fitter than appearances might suggest - this is without question the first time in the 20 years we've been together that I've been fitter than him in any way! February is going to be less full on by necessity I think - my poor knees need a bit of a break. Ideally I'd like to slip into a bit of a pattern of running a couple of times a week, going to the gym once, and swimming a couple of times a month. I want to do more parkruns, and I also want to do a "proper" 5k as well (for which read "one with a blingy medal at the end of it!). Some friends and I have a plan to do a 28 day sit-up/push-up challenge as well. Looking further ahead I've just signed up for a 100k in 100 days challenge as part of the #RAF100 Celebrations - very achievable but ever so slightly scary. (And will mean I definitely will need to do some more running on Islands...more on that in due course). While it can be done walking or running, I'm determined I want to run the whole lot - it averages out at a little over 7k a week so should be very doable I think though. For now though and for the purpose of this blog it's on to the next big 2018 Challenge - Frugal February starts tomorrow! 2018 Challenge No. 1 - 3rd Update! Yep - I'm still going with my "Exercise every day in January" challenge! 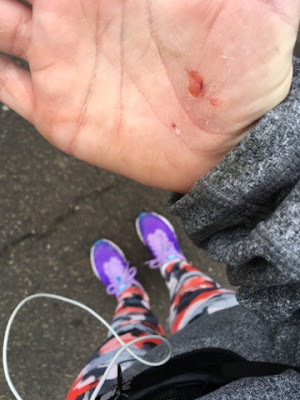 I HAVE had to scale back my running though - my joints were just getting too painful and the warning signs for not risking doing too much and wiping out altogether were there and have been heeded. I ran last Thursday (5k in a sub-30 time - go me!) and on Saturday (hill repeats in the rain....glug) and then did a LOT of walking on Sunday (30,000 steps worth of walking, to be exact!) and by Monday my legs were saying "errr...no" so this week has been about listening to my body, taking a step back and being sensible about things. I've learned a lot in the last year about stepping things back and listening to my body - I've not had much choice to be honest as I reached the point where I simply couldn't do the things I wanted to. You can battle, and fight, all you like, but sometimes you just hit a wall and have to admit, well, if not "defeat" at least to a cease-fire! I've learned that generally, if the messages you're getting internally are "stop" or "slow down" then there's a reason for that and it needs heeding as otherwise there really can be serious consequences. I've had a lot of comments and questions about this - so I reckon this post will be a good chance to address some of them. The one I've been asked again and again is how come I'm OK to run bear in mind my joint problems - very valid indeed! The first thing to say on that I think is that if you're someone who does have health concerns of whatever type, and you're looking to start or increase the level or the impact of the exercise you're doing, then ALWAYS seek advice from your GP first. I was pleasantly surprised as I was half expecting to be told that it was simply too high impact for my knees to cope with but in fact the advice for me was that running was fine but it needed to be "proper" running - absolutely NOT jogging as that potentially would cause problems. So right from the start I've had to concentrate on posture, really lifting my feet, and keeping my strides even and my steps light. Knowing the things I needed to be careful about was such a help and I absolutely wasn't made to feel silly for asking. The other thing I was told was, yep, bet you're there ahead of me aren't you - "listen to your body" - so basically a bit of discomfort, some achiness, was to be expected, but if I started feeling significant pain to stop doing what I was doing and step it back a bit. I can do as much swimming as I like - again, no surprise there - but I'll never be someone who can run miles 6 days of the week. Another comment that I've had is "Oh but it's all well and good for you - you can do this stuff, I can't even do a press-up". Oh how I laughed - you see, and I'll let you into a secret that I've only learned recently here. You know you think that "everyone can do a press-up? Well, back the truck up, turns out not only can not "everyone" do them, but in fact MOST PEOPLE CAN'T! (Well, from the very amateur straw poll I took around people I know who aren't in the military, that is!). When I first started this "trying to get fitter" malarkey, I literally couldn't even begin to do a full press-up - so MrEH got me to do "box" press-ups to start with - with my upper legs at right angles to my body, so my legs still took the majority of my body weight. Each time I tried them I moved my knees a fraction further back, so eventually I was doing "proper" press-ups but off my knees rather than my toes. Now I can manage 30 seconds of full off my toes but usually have to go back to the modified position after that - but it's improving all the time. The same is true of sit-ups - I STILL can't do a full one without someone holding my toes down. I'll get there though - and the feeling when I manage that first one will be brilliant! Overall, one of the best bits of advice I was given when I started with all of this, which might be of help to others was "Just do something - anything is better than nothing" - and that really made sense, and genuinely is something that anyone can do, to one degree or another. So (with the nod from your GP) if you can run - then run. If you can't, walk - briskly and for a reasonable distance. If you can't manage that then try a walk at a moderate pace - you're still burning extra calories and giving your body a bit of a workout. If you can't manage that, or are restricted to what you can do in the house for whatever reason, then maybe try to make an extra trip up the stairs once an hour, or even get up and walk around for the duration of the commercial breaks or the gap between programmes. Each and every time you move about you're lapping everyone who hasn't moved from the couch. Why not get yourself a set of light dumb-bells and do bicep curls sitting upright on a chair - you can even improvise with a can of beans or a small bottle of water in each hand to start with! If that's no good for you then maybe give yoga a try, or some other form of stretching workout - it's amazing what an incredible difference even a session of that sort of thing once a week can make, and all this stuff, if it's extra to what you;d do otherwise, will improve your fitness. Something that is often said of older folk is that those that are able to keep themselves active tend to lose their mobility less and retain better balance etc - "Use it or lose it" - and research seems to bear that out. The key thing is again - focus on your body and don't do so much in one session that you can't do anything at all for days to follow -this truly is a slow and steady wins the race situation! At the time of writing - day 25 - I have indeed kept to my intention to exercise every day, and that in turn leads to another comment I've had - that it's not good to do too much, or to fail to take rest days. Now this one is true - and this level of exercise is not something I'd want to keep doing for too long for sure. 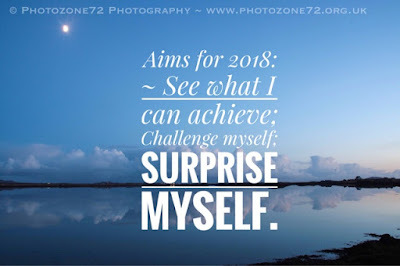 My reasons for doing it though were as I said originally - that I wanted to kickstart the year really well, and to prove to myself that actually I COULD do more than I had been - and it's definitely achieved its aim from both of those perspectives. Because I allowed for walking to count as well this has kept it less harsh on my body than had I decided to commit to running every day, for example. It WILL only be a one-month thing though - I'll be working out a more sustainable long term plan for myself before the start of next month. 2018 Challenge No. 1 - 2nd Update & hurty days! Halfway through the month already? This one is flying by! I meant to do this second update at the 15 day point but somewhere along the line time slipped by me! So - 17 days in and I'm impressed to say I'm still sticking with my #EED0118 challenge. So far this month I've done a lot of walking, quite a bit of running, 3 visits to the gym, 4 x HIIT sessions. Plus of course as I mentioned in my last post I've completed the C25K programme and run a parkrun as well - that seems like quite a bit of "achieving" for one month already! My step count is easily topping 100,000 a week and I increased my walk/run mileage last week to 50 miles from the previous week's 47. I'm also starting to enjoy exercising each day - I'm mostly looking forward to my runs and loving the fact that I can now "just go and do a mile run" - the very thing I wanted to be able to do when I challenged myself to learn to run originally. I love that I can think in terms of doing that and know that yes, I can do it - that feels like a real win. Having said that though it's still not always easy. My legs ache/hurt pretty much daily at the moment - sometimes simply as a result of muscles tightening up from being used in a way that they've not been used in for a lot of years. My joints are complaining a fair bit - today is one of those days that everything seems to hurt - my knees and hip are stiffening up every time I sit for any length of time and when I get up I feel like I'm hobbling around like a little old lady! More stretching will help - I know that much - and to an extent I figure that at the moment I'm also asking quite a lot of my legs, I have after all taken them from being lucky if they did 5,000 steps some days 18 months ago to averaging 14 - 15k a day now, quite an achievement in its own right! I'm guessing that they will gradually get used to me having higher expectations of them! I've got some challenging days coming up with a trip to Manchester including two nights in a hotel. The friday will easily be covered by doing a LOT of walking I suspect - we rarely use public transport around the city when we're up there, preferring to walk from place to place, the Saturday will be a hotel-room HIIT session - relatively easily done with the aid of a folded towel as a mat and a focus on upper-body & core work. The Sunday will be the biggest challenge with the likelihood of a bit of a hungover state - at a pinch I'll pin my hopes on a brisk walk home from the station when we get back, but may be able to cram something else in earlier in the day depending on how I feel. We'll see! On the running front I've decided for now to not particularly look at increasing distance, but instead to focus on some speed work to try to build my pace up a bit. I'm also starting to incorporate inclines on the treadmill with a particularly nasty little intervals run involving short bursts of running up a gradually decreasing incline but as the incline drops, the pace increases. On paper it appears simple but you definitely know you've done a workout afterwards! My plan for the next few weeks is to do at most a couple of 5k runs a week (the second one will be parkrun the weeks I can get there I think) and an intervals session, along with probably just a mile or so here and there when I need to shake my legs out a bit after a longer one. For the gym I'm looking to increase the weights I'm doing, and my HIIT stuff will start to incorporate more of a focus on leg strength which will hopefully help with supporting my knees in particular. I'll continue to squeeze in walks whenever and wherever I can and work on making sure that my lunchtime miles are done at a brisk pace too. I'd love to be able to increase my mileage week on week through the month but suspect that might be a slightly tall order! ...yes, THIS early in the year! You might also remember that at the tail end of last year I started working through the Couch to 5K programme, and that buried in my list of things I wanted to work on this year was "Run a parkrun"? well this morning I decided to double-up those two things AND deal with today's #EED0118 effort by making my final C25K run of the programme our local parkrun. 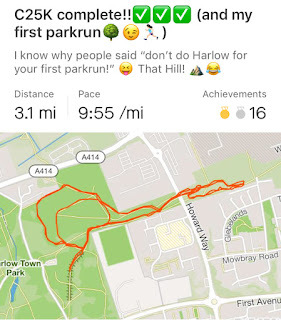 Now before I go any further, I should say that several folk had said to me "don't for goodness sake do Harlow for your first one - it's a devil of a course!" 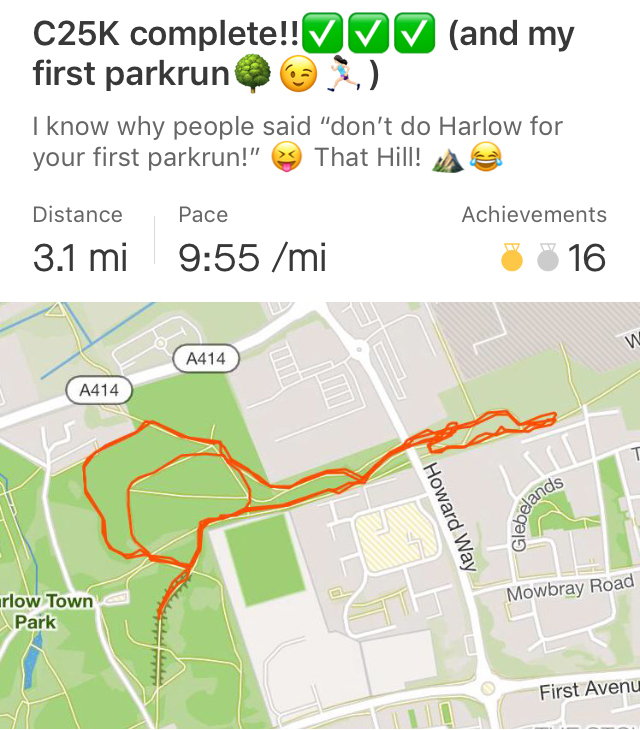 - it's held in our Town Park which is absolutely gorgeous but VERY hilly - and so far I've done almost nothing with hills...so I've spent the last few weeks wandering through the parkrun pages on t'interweb for the surrounding area and debating which one to do. Settled on one in a town slightly south of here - then realised that it meant faffing about with paying to park. Looked at another one a few miles west but don't really know the area...and eventually just thought "How bad can it be? "and decided to do Harlow anyway. Walked across with MrEH (there for moral support - not running! ), nearly bottled out when I first got there as there were PROPER RUNNERS there and I was terrified and wondered what on earth I was thinking. MrEH reminded me that I KNEW there would be people slower than me, that I knew I could do the distance, and that if I needed to walk I knew there was no shame in that - except of course I'd decided to tie it up with that final C25K run hadn't I which meant NO WALKING! Newcomers briefing was called and instantly set my mind at rest as it was so friendly and I liked the fact that it wasn't just first timers gathered together but regular parkrunners who were at Harlow for the first time ("Tourists" in parkrun language) although I was a bit freaked to see two "London Marathon" running jackets among the group - eek! The main briefing was made rather tricky to hear by some folk around me who obviously decided that as they'd heard it all before it was fine to talk right through it but I managed to grab the salient points from it thankfully, then we gathered at the start and suddenly the people in front were starting to run and we were off! Running with other people for the first time was odd - I was terribly conscious of not wanting to get in people's way and so I'd set myself up right towards the back, but in fact I could have gone quite a bit further forwards with no issue. I was also terribly conscious of not being drawn into going off too quickly which of course inevitably lead to me going off slower than I needed to instead - a couple of minutes in I realised I was going slower than my usual pace and picked it up a bit. The run is 2 x 2k laps followed by one partial lap of 1k to finish, undulating up and down all the way - and about two thirds of the way round the 2k lap is what will now be known as #ThatHill - I'm familiar with it as we puff our way up it every time we walk back from the station to home. In other words - it feels steep when you just walk up it. It was as we approached it for the first time that I realised that it looked like it was part of the course...but no, hang on....oh hell it is! It was also exceptionally muddy which REALLY didn't help - I slogged up it, feet slipping and sliding all over the shop, and finally reached the top absolutely gasping for breath - thankfully from the top the course levels out a bit allowing you time to catch your breath before a short downhill takes you back to the beginning of lap 2. Needless to say I ran the whole of lap 2 positively DREADING the wretched hill! Second time round at least I knew what it was like - not entirely sure that helped but I was at least prepared for the worst of the mud and knowing I didn't have to do it again I was able to power myself up it a bit more effectively as I was less concerned about not having enough left in my legs & lungs to finish! The short lap to finish proved pretty much no problem at all and I was well able for a sprint (downhill - bless them!) to the finish. Oh the feeling as you cross the line that first time - just amazing! One week down and I'm doing OK! I confess I'm feeling slightly surprised about this as I entered into this feeling that it was quite a tall order for me - well obviously as otherwise it wouldn't be a challenge, would it now! I was wary of those days when the weather was grotty and I didn't want to get wet, or when I got home and couldn't face going out again, or arrived home a bit late and was STARVING hungry and didn't want to take the time to do any form of exercise before I ate...and sure enough I've had to tackle all those things in the week and so far I'm still on track - go me! The first few days of the month I've mentioned in my original post about the challenge - the 1st was that run (and fall!). The 2nd was the first day back at work so I knew it would be a dodgy one - plus I had a hospital appointment at the end of the afternoon - so I planned ahead to do the intervals sets and just got on and did them when I got home - all good. Wednesday was the day of the light traffic and the long pre-work walk - while I won't often manage to get that sort of distance before coming into the office I can usually manage at least a mile - although those miles aren't counting for the purposes of this challenge. On Wednesday I also did an hour in the gym after work - I really mix it up when I'm there - I only go once a week and so try to get as much value from it as possible - so I mix up the treadmill (running and intervals with an incline/sprint intervals), some mat-work (basically the same sort of stuff I sometimes do at home but usually a single set and often the stuff that's more comfortable to do with mats rather than thin carpet underneath me) and the weights machines. I have a rough programme but it is only quite rough - I vary it depending on which machines are available so it doesn't have any kind of set rotation to it. It took SO much nerve for me to get back to the gym - it was something I always enjoyed years ago but I guess I'd just got out of that "gym mindset" and had slipped into thinking that I'm not that sort of person...thankfully I found the nice, friendly little gym at the community sports centre near to work, and that suits me brilliantly! They offer a community rate to those living and working locally so I can simply turn up, pay £7 and off I go. Because I go straight from work it cuts out that thing of getting home and not wanting to go out again, which in real terms means I do it rather than talking about it, then deciding the sofa is more comfortable. Thursday I knew I needed a lower impact day - my joints were painful and achey - not unusual in itself but this was worse than usual and I knew if I was going to keep up through the week I had to factor in a more gentle on myself day - so I made the effort to walk a couple of miles before work (in the rain, no less!) and another couple after work. And then I told myself - "that's enough for today" - ands therein lies ANOTHER issue with goals and targets and challenges - it's too easy to fall into that trap of feeling that you constantly have to be at 100% on it - you don't, it's absolutely fine to mix up a few 50% days in there, to remind yourself that actually, you're achieved what you set out to do, you don't always have to feel you're over-achieved. Sometimes enough is, well, enough. Friday I'd always planned to do another C25K run - I knew I had the option to get week 7 ticked off inside that first week of the year so I went for it. I'm now at the running for 25 minutes straight stage - not anything I ever thought I'd manage, and something I've learned is that the first 5 minutes or so is ALWAYS hard work - you think your breathing is never going to last out, that you're incredibly slow, you feel every twinge and hurty bit. After that first little stretch though comes the sudden realisation - how far you've run already in that time; that suddenly you're able to breathe more easily; that the bits that were hurting, the knees that you were afraid at the start were going to collapse on you, actually now feel OK; and that you've found your rhythm, and that you can now run mostly on autopilot, without having to think too hard about it. Once you reach that stage you also start to understand something - that if you can keep going for that time, you can keep going for longer. The first time I really "got" all that was the run at the end of week 5 of the C25K programme - the one I'd kept looking at and thinking "No WAY!" about - a solid 20 minutes of running when prior to that the most I'd done in one go was less than half that. The final minute of that run was INCREDIBLY hard work, until I realised that the final minute I was then running - that was the self-same 60 seconds I couldn't manage when I started - and now I was doing it after running another 19 minutes! Saturday - a walk into town and back again (brisk pace - 2 miles each way) and then some HIIT intervals in the afternoon - mostly focused on core stuff and leaving legs pretty much alone again to give myself a lower impact day. And finally yesterday and the third Week 7 C25K run - and boy oh BOY did I not want to go out in the cold and do that one! I started thinking of possible "reasons" (yep - excuses, you've got it!) for not doing it the night before, finally managed to force myself out a good 45 minutes after I'd planned, then spent the first mile convincing myself why I should just go home again... Of course I didn't, I sucked it up, carried on, made myself do an extra couple of minutes at the end as I'd been pathetic and slow at the beginning (I hadn't as it turned out!) and ended up running 2.7 miles at sub-10 minute mile pace. This week will be pretty much a mix up of the same again. I want to get a short run in there somewhere I think - probably just a round-the-block mile to remind myself it doesn't always have to be further - the whole point of running in the first place was that it would give me a reasonably quick route to exercise and now I'm in a position where I can really start making use of that convenience. I'm hoping to get another 2 C25K days run - I'm incredibly keep to get the programme done and ticked off now and actually I'm starting to think that I might even be able to make that final run of the programme a Parkrun - which would be quite exciting! The gym will feature again, and some more HIIT stuff probably mostly focused on core & upper body. My FitBit tells me that in the course of last week I covered 47 miles between walking and running so it would be really nice to see if I can get anywhere near that again. It's funny but at the moment it rather feels as though one challenge is sort of naturally leading me in to another which is interesting for me - I've even started looking into possible 5k races to enter - mad! If you've sent yourself a challenge or several for 2018 how are you getting on so far? I'm technically jumping a bit ahead of myself here - but I'm already thinking ahead to my second monthly challenge of the year - it's going to see the return of Frugal February! The eagle-eyed and sound of memory will recall that I said in my list of goals for the year that we were aiming to re-focus on some of the frugal stuff again - just try to get our eyes back on the ball a bit if that makes sense. It's odd - one of the things that just about everyone I know who's had a period of time where they have been voluntarily frugal to pay off debt, or a mortgage, says once they've achieved their aim is that it's quite difficult to get out of the mindset where you feel guilty, or uncomfortable, about spending money. The good side of this is of course that you're never likely to massively overspend again - the habit of saving up, of seeing what else you have that will do the job instead, is too deeply ingrained for that. What does happen a bit over time I think though is that small things start to creep in, little frittering habits sneak back up on you. Never much - just a pound here or there, but the result is that you end up with "stuff" that you hadn't planned, and don't really need. The Credit card bill can still perfectly easily get paid when due, but there's just that little bit more on it than really, you would have liked...and THAT is the side of things we want to address a bit. There are things that we won't be doing - we have some trips out and about planned, and those will still be happening. MrEH's car needs a service & MoT. We will still be heating the house, and still be eating well. Stuff that we NEED will still be purchased, but stuff that we just WANT may well get put on hold, thought about, and only bought after a short review, if at all. - I have plenty of assorted toiletries stashed, and will be aiming not to buy more until I actually need to. - We currently once again have an absolutely jam-packed freezer and one thing I intend to do this weekend is to do a full audit of that freezer and then meal plan ahead using the contents. - Books - I got a number for Christmas and also bought myself a handful of charity shop paperbacks just before the festive season so I have plenty to read going forwards. No more to be purchased until I've read those I have! Clothes - now this is a trickier one. There IS still things I need, I'm still wearing a number of tops that are far too big for me, for example. Some things can be purchased from charity shops - it's amazing quite how often I find a pretty much unworn fitted M&S scoop-neck top hanging there just waiting for me, for example. I will also keep my eyes on trousers and skirts that will do as work-wear. Other things do need purchasing new either for hygiene reasons (underwear, nightwear, shoes - do not get me STARTED on charity shop shoes - and Exercise kit - I refuse to wear an item that somebody else's crotch has sweated into before mine), or because generally by the time they hit the charity shop they look more "past it" than I'm comfortable with - pretty much anything light-coloured falls into this heading, as does anything with a fleecey finish. I freely admit I'm a terribly fussy charity-shop shopper - but I do like the idea of it, so will persevere for those items where it works for me to do so. I'll be reviewing my list though, and also doing some more decluttering of cupboards and the wardrobe. One thing I DO want to really look at is how easy the whole "contactless revolution" has made things. I used Apple Pay a lot, and I think there is no question that it does make you think less about spending than handing over a crisp fiver would. I want to focus back on using cash a lot more for the first part of this year - it will also make my monthly credit-card statement reconciliation far easier too of course! I keep saying the same thing about it - that the ease of just tapping a phone on a reader to pay for something is going to get a lot of folk in a lot of trouble - and I honestly think that's dangerously true. I don't think I'm likely to be one of them, but even I have to admit that it genuinely doesn't feel like "spending money" in the same way. There might be other things that will occur to me ahead of really starting the challenge on 1st February, if so I'll note those and incorporate them - both otherwise I'll be back on the first Friday in Feb with my framework and intentions for the month! So I've decided that for my first "challenge myself" thing I'll be starting the year with a kickstart of "Exercise Every Day in January" - I have friends who have joined in with Run Every Day January and I would probably have gone for that except like a twit I took it at face value and decided that a plan that wanted me to run every day with no rest days wasn't for me. Of course as it turns out it's not quite that, and I could have counted all the other sorts of exercise I do as well, but by the time I realised this it was too late to sign up so there you go! I'm including a variation of things as I know from experience that trying to repeat the same form of exercise too many days on the trot causes me issues with injury. My gym sessions will count, as will a brisk (15 minute mile) walk of at least 2 miles taken specifically as exercise. I'll also be throwing in HIIT sessions on days that I'd normally not be doing other stuff as a lower impact way of keeping things going - I've got a handy interval timer app on my phone which gives me nasty little sets of 8 x 30 seconds work with 10 seconds rest in between them - turns out 10 seconds is JUST long enough to change position for the next exercise, but not enough to give you any sort of a rest, so that's not as easy as it sounds. Similarly, 30 seconds Plank is easy until you get to the final interval of a core set, at which point it becomes less so...! My thinking on this is that if I can start the year with exercise as an ingrained habit, then that's setting me up well for the rest of 2018. In fairness it's already pretty much there, and I'm rapidly finding that the more I do, the more I feel like doing too - there's no question that it helps my energy levels. This will target those lazy days when it's easier to say "Oh I'll call this a rest day" than do anything though - and having friends doing a similar sort of thing means that I'll be more determined not to let myself down in front of them. If you're interested to see how I get on I'm using the hashtag #EED0118 on both Twitter and Instagram to keep track. I've also decided to continue through this month logging my food on the FitBit app - I'm presuming that there will be at least some sort of weight gain from a couple of weeks almost entirely "off" tracking everything over Christmas, although we did stay pretty active throughout, so I'm dropping calories a little this week too and will see how things stand when I weigh myself at the end of the week. I'm not after losing more weight as such, but I do still have some toning up to do, and would like to reduce my body-fat percentage a little more as well, at the moment it's still a little high. I'm aiming to continue with going to the gym once a week mostly for strength training as well as bodyweight exercises at home in those HIIT sessions, and I want to start throwing some hill-work into my running as well, if I'm ever going to make it right round the local Parkrun course then I'll need to do that! I'd like to get back to regular swimming again too but at the moment that doesn't quite suit me - nothing I hate more than coming out of the swimming pool on a freezing cold day with soaking wet hair! So far I started on the 1st with a run - which I managed to fall over a mile into which wasn't ideal. Turns out it's all well and good spotting the muddy looking puddle and thinking "I'll avoid that" but you need to note where there are loose patches of gravel that your foot will land on instead, too. One skinned hand and a rather sore, bruised knee later...I was so determined not to have to count it as a stop that would blow my Couch To 5k day that I got straight up and carried on running though! Yesterday was 3 x sets of those intervals I mentioned earlier - 1 x core, 1 x legs & 1 x arms/shoulders. Today we reached London earlier than usual thanks to very light traffic so I set off for a 3 mile walk before heading into the office - done comfortably inside that 15m/mile target pace too so that counts, and I am also heading to the gym this evening for my first session there of 2018. The walk this morning underlines one of the biggest changes I've made in my mindset over this whole thing - back in Autumn 2016 my immediate reaction would have been to have sat in the car for that spare 45 minutes until it was time to head to work - this morning that didn't even cross my mind, and as a result of doing that I already had nearly 6,500 steps under my belt by the time I reached my desk. It also goes to show how easily you can add additional activity into a regular day once you ditch the "haven't got time" mindset. I'd be really interested to hear whether anyone else has "movement related" goals for this year - and if so how you're planning on implementing them! At the beginning of last year I said that as usual, I wasn't going to make any "New Year's Resolutions" but instead I came up with a list of things I wanted to try to change about my life over the course of the year. What followed was unquestionably the year in which I have made the most changes to my life, and indeed myself, ever. I've made new habits and broken old ones. Got fitter. Shed somewhere around 4st in weight and dropped several dress sizes. Streamlined my friendships and learned to share my time with people who I know genuinely like me for me, not for what I can get them. Learned to be more cautious about people. - I set myself a goal to do at least 5,000 steps a day - it's now rare that I don't exceed 10k - but when I don't, I don't, it's no big deal. - I wanted to change the way I was eating - I have, with the results detailed above. - We planned to continue with works to the flat - and the last year has seen us gain a fabulous new kitchen, and a whole set of new windows and doors! - We aimed to continue putting aside a good amount into our savings accounts and we've done so - that pot will continue to pay for improvements to the flat still needed, and to build ready for a future Hebrides property purchase. - I wanted to have paid off at least £700 from my 0% card by the end of the year - and ended up with a figure of £703 paid off, a massive chunk of which was funded by doing surveys, and earning cashback on things I would have bought anyway. -...and to have paid off that amount without dipping into savings to do so - not a penny of the money that was stashed aside to pay for the items has been touched to make payments to the card. - I planned to upgrade my long lens this winter - it got done slightly earlier at the end of August as I had saved the money to do so. There were a number of others things as well - some of which have been tackled already and others will continue to be a work in progress for a while longer. I'm in many ways a very different person to the one I was when I set my goals at the start of 2017 - I'm certainly a fitter, stronger one. And I've discovered I like that feeling of being stronger, of being an active person. I've learned that I can run, and that I can be brave enough to go back to the gym. So it's now time to think about a whole new set of goals for a new year - and I really feel ready for some challenges too. I've summarised this online already as I really find the accountability of throwing things out there publicly works to keep me determined. - Exercise at least 3 x per week - more is fine. Gym, running, swimming, circuits, HIIT Sessions - all good. - Stretching is good and helps facilitate the exercise. Ideally a full stretching session at least once per week and mini sessions scattered through as well. - Do Parkrun - either our local one or another, it doesn 't matter which, just DO IT! - Visit the local climbing wall for a session. Home: We want to continue with the works on the flat, initially to make it a lovely place for us to live, but also to add value. - New coffee table for front room - this is a quality of life thing. - 0% card must be cleared by the end of October, and again as far as possible this needs to be done without touching savings. - keep the extra savings ticking over to ensure that our Lundy trip in the spring doesn't have to be paid for from savings. - Refocus on the small stuff - the odd frittering, and the impulse spends that have started to creep in a little. - "Frugal February" to assist with the refocusing on the small stuff. - Learn to be more tolerant without letting myself be used, and a little more patient without taking unnecessary amounts of sh*t! - "Let it go" and "This too shall pass"
- Try not to feel hurt or upset when other people behave unpleasantly or unkindly - I can't control their behaviour, I can control my reaction to it. - Tidy up laptop in readiness for the new Airshow Season. - Try to tick a couple more items off our big "We want to..." list. My intention is to pick out a single item to make a main goal each month when I've realistically got the time to focus on it, as well as working on progress on other items throughout. January is "Exercise Every Day in January" - as I wanted to kick-start my year on that front with really keeping up the habit of being active. Several friends have signed up to a Run Every Day challenge for the month, mine is simply to do "something" whether it is a run, the gym, a swim, or some form of exercise session at home. I want to start the year with a real focus on ditching the excuses and not finding reasons to NOT do things, as this is still somewhere that I fall down. If nothing else I can go and run my "standard" circuit which is a mile and a half - and can be done inside the 15 minutes that as previously established, we can do anything for! The one thing that's NOT on the above list of course is "Blog regularly" which I suspect has been on my year-list every single year in recent times, and I've always failed with it. This doesn't mean that I don't want to do this, just that I've decided to let go making a "thing" of it. Perhaps that will work better than a more stated intention on this one? We'll see!